We will begin the next Shroud of Turin series hopefully in March 2019. We are looking for a home in the Conejo Valley region to host. "...among the most fiercely debated subjects in contemporary science, an extraordinary mystery that has defied every effort at solution. The 8 Session Series in Reseda is completed and was truly transforming. We are taking another 8-session deep dive into the properties and history of the Shroud with PowerPoint presentations, video documentaries, questions and answer time, and also have some worship, prayer for the sick and fellowship. After studying this cloth since 1978, I am convinced of who the man on the Shroud is. We all have our own sensibilities however so you can safely come, see, learn, decide for yourself. Call 805.419.9940 or fill in the form below if you are interested in hosting or attending a class. The Shroud of Turin is an ancient linen cloth measuring 14’ 3” x 3’ 7” (8 x 2 cubits) which bears the front and back image of a bearded bloody scourged and crucified man. It is currently housed in St John the Baptist Cathedral in Turin, Italy. It is by far the most studied and controversial artifact in human history because of the possibility that it truly is the burial shroud of Christ. National Geographic called it "one of the most perplexing enigmas of modern times". Time Magazine called it "The Riddle of the Ages". shroud face close up - italian photographer secondo pia, the first to photograph the shroud in 1898, discovered that the image on the shroud (left) was actually a negative image (light and dark inverted) when his actual negative (right) turned out to be a positive as it developed in his darkroom. Scientific investigation by the Shroud of Turin Research Project in 1978 (STURP) conducted 120 hours of hands-on testing and has made one conclusion certain; the image is not formed by any known process, including the application of paints, inks, dyes, powders, stains, or chemicals. All attempts to duplicate it have failed. The shroud of Turin remains absolutely unique in the world. In 1988 the shroud was carbon dated to the 14th century, yet peer reviewed findings in 2005 by Los Alamos Lab Chemist and STURP member Ray Rogers has overturned that verdict when it was discovered that the C-14 test sample of the linen cloth was contaminated by an interwoven cotton patch. See article in the journal Thermochimica Acta. Is the Shroud of Turin the burial cloth of Jesus of Nazareth? We believe that all evidence affirms authenticity and that it is a love letter preserved by God to the modern age. Below Top is a photo of the Shroud and Image . 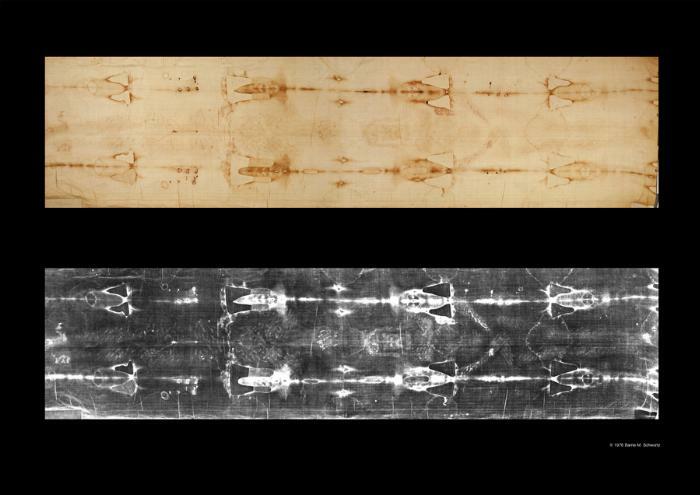 Below bottom is a negative image of the Shroud. When first photographed in 1898, it was discovered that the actual shroud was a negative image, (lights and darks reversed) and the negative image was a positive. This caused a firestorm of controversy which has not ended. THIS FIRST SCIENTIFIC DISCOVERY BEGAN A FIRESTORM OF CONTROVERSY AND IS ONLY ONE OF THE AMAZING PROPERTIES OF THE IMAGE THAT HAVE NEVER BEEN EXPLAINED OR REPLICATED AS IT IS ON THE SHROUD OF TURIN. An overview of the amazing properties of the Shroud which have not reproduced by anyone anywhere. Peer reviewed research on the mis-steps of the C-14 testing in the 2005 findings of Los Alamos Lab chemist Ray Rogers proving that the C14 sample in 1988 was mix of original linen and a cotton rewoven patch published in Thermochimica Acta. Overview of the Shroud of Turin Properties and behind the scenes politics that removed the STURP team from choosing multiple sample locations for C14 test on the Shroud. 5 safety protocols that were violated in C14 test. 3. All 7 Major C14 Labs given samples, not just the new 3 AMS method labs. 5. No conferring by labs, all results published when all tests complete. Documenting photographer for STURP, Barrie Schwortz, gives talk on the Shroud of Turin discussing the science along with personal stories. Created by STuRP Documenting Technical Photographer Barrie Schwortz. This is a clearinghouse for all the scientific research and papers. Overview of Scientists from Enea, the National Agency for New Technologies, Energy and Sustainable Economic Development, Italy, which published a report on five years of experiments conducted in the ENEA center of Frascati on the shroud-like coloring of linen fabrics by ultraviolet radiation. This is a media report on their 5 year study measuring the extreme superficiality of Shroud image which penetrates only 200 nanometers (I’ve seen up to 700 nanometers - 7 microns…it’s small!) on the top fibrils only, within the 200 fibril threads of the Shroud linen. Created by Stephen E. Jones This is site us user friendly and well foot noted. Created by Dan Porter This site has become a live blog with discussions between authentics’ and skeptics. Studies on the radiocarbon sample from the shroud of turin Raymond N. Rogers Published in Thermochimica Acta 2005 © 2004 Elsevier B.V. All rights reserved. Rogers was a chemist from Los Alamos Labs and member of the STuRP project. First photo of Shroud in 1898 by Italian photographer Secondo Pia revealed that the straw yellow image is actually a photographic negative. (light and dark colors inverted) Pia's negative plate was a shocking positive. Pia earned many accusations of fraud for this photo. Second photos by Giuseppe Enrie in 1931 confirmed Pia's photos were not fake. 1972 VP8 Image Analyzer revealed linen to body three dimensional information within the Shroud image. This characteristic revealed that the Shroud image was unique in the world. No attempt at duplication has been able to create an image with this property. This revelation prompted world-wide interest. Post-mortem blood was found by detecting serum halos under ultraviolet photography, invisible to human eye. No image below blood. The blood was on the cloth first. All image formation theories must account for this. Image is a faint straw yellow color penetrating one microfibril deep. 1/500 of an inch. Only select fibrils have color. This is not one thread deep, but one microfiber, a couple of microns thick. Color is on portions of micro-fibers. The image is thermally stable. One drop of molten silver burnt through the cloth from a 1532 fire in a church in France where the Shroud was kept in a silver box. Silver melts at 900+ degrees C. The image next to the scorch was not changed, as it would be if any substance formed the image. The image is not defusable. Water was used to put out the fire on the Shroud and if any powders, dies, paints were used, they would have been diluted and spread. The image did not respond to the water. 1978 - 24 Scientists of the Shroud of Turin Research Project formed in 1977 (STURP) were allowed to examine cloth for 5 days around the clock. A discussion on the Image Formation problem by Adler demonstrates why all attempts to duplicate the Shroud have failed because they cannot replicate all Shroud properties. Visit the Shroud Exhibit and Museum for additional presentations by Pete Schumacher, VP8 Image Analyzer Engineer. See interview with Pete here.